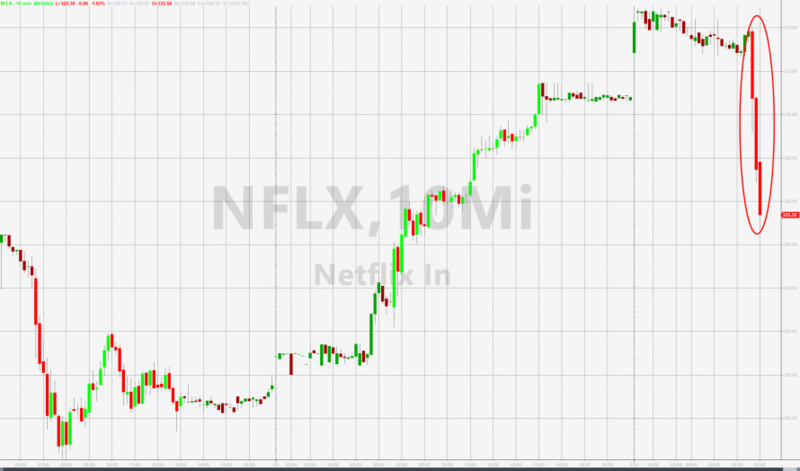 Having hit an all time high last week, and repeatedly crushing skeptics such as David Einhorn and his short basket, Netflix appears simply unstoppable. It did stop, however, and drop nearly 2% moments ago when short seller Citron Research tweeted that it's time to short the stock back to $300 as "content spend is unsustainable in the long term." "Stranger Things happening at $NFLX. Wit mkt cap up $17 BIL in a week and short interest. at 10 year low. Citron thinks the stock can be shorted back to $300. Content spend unsustainable long term. Great article today's FT tinyurl.com/y9cwvqbu Congrats to bulls, historic run." ... but also the massive cash content spend compared to its biggest peers: a strategy meant to gain market share without any regard for the cost, and which works until i) central banks raise the cost of capital, ii) investors realize they've been drinking Kool-aid for years. ... although like on every previous occasion, this will likely just become another invitation for algos to BTFD.